Howard Phillips and David Killingray’s edited collection, The Spanish influenza pandemic of 1918-1919, new perspectives (Routledge) of leading international scholars talking about their work. When this was published in 2003, no scholar had yet done anything on the Irish picture. I got my hands on it as I was doing my MA thesis on flu in 2005, and it’s been my influenza bible ever since. It’s taken me all over Ireland, to places like beautiful Lough Swilly, where the navy vessels sheltered on the north Atlantic route, and where troops spread flu into the local community. I find myself constantly searching in graveyards for deaths likely to be from influenza, and to create stories from available facts for the influenza victims they contain. Last year I came across a wonderful set of graveyard records in the Minneapolis Pioneers and Soldiers’ Memorial Graveyard, thanks to Sue Hunter Weir and Jim Rogers, who know of my interest in all things to do with the 1918-19 influenza dead. That’s probably the furthest I have been! Being able to recreate the lives that were cut short by the influenza pandemic, being able, with the help of the relatives of the dead, to tell their stories, piecing them together between us. Trying to stay on top of all the changing concepts of medical understanding at the time. Having to fish, when reading contemporary accounts, to see what ideas were still grounded in the concept of miasmas, rather than newer medical understandings, which were underpinned then by bacteriology. And in turn, to spot the doubts about influenza being caused by bacteria. It was not until the 1930s that influenza was confirmed to be a virus, but there were suspicions amongst some medics in 1918 that this was not bacteria. This is my first published book, and I am SO excited. I’ve been working on this topic since 2005, so it has been a long gestation. 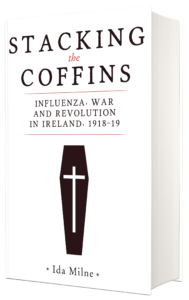 Because MUP is a fine press that does a lot of Irish books, but also because this book should have international legs – there is quite a strong international history of the 1918-19 influenza research community, and MUP will be well placed to promote it internationally. Much of my previous work has been for edited collections or journals. I suppose I got brave in this book, encouraged by the MUP editorial team, who could see a bigger book within what I had written, that was not there yet. 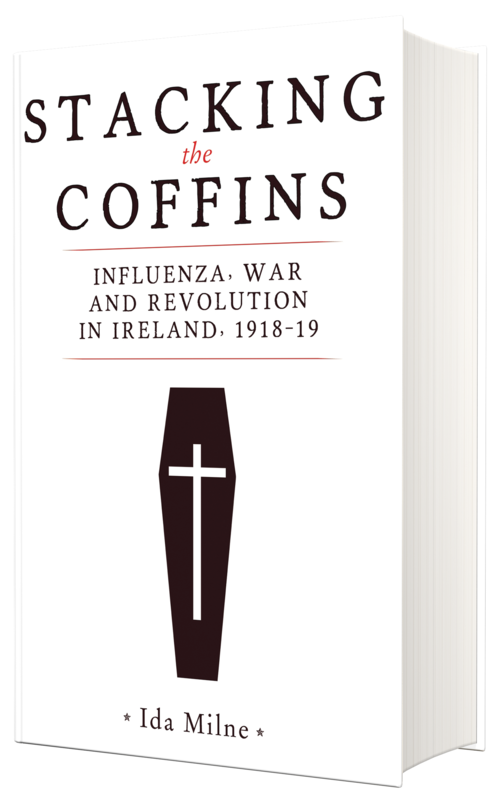 A book not just about flu in Ireland, but more about the war and growing nationalism context, and how flu impacted on them. They helped me – gave me the confidence to make it a lot more engaging, I think. At the moment, I hold an Irish Research Council Marie Curie fellowship working on the changing landscape of death and suffering from infectious diseases of childhood in 20th century Ireland. This is also a fascinating story, and people tend to forget just how bad it was. That is probably one of the reasons the 1918-19 influenza pandemic was a forgotten history until recent years – because so many, particularly young children, were dying from infectious diseases. The flu was just one more noise in a cacophony of diseases. I have collected oral histories of sufferers, their families, and people involved in the management of infectious diseases of childhood. After that, I intend to specialise more in the memory of the long term impact of the influenza pandemic on families, which I have started to do in this book, but which needs a more thorough treatment. It’s a story that gets more fascinating, with time. Stacking the coffins publishes in May and is available to pre-order now! Take a look inside the book by clicking on the image, below. Category: Author Q&A, Blog, History, Social History	1 Comment. A really fascinating book. Dr Milne has passion and insight. Loking fotward to launch.